Peeks Around 15 is the top shelf of my desk. All kinds of stuff. It's an altar of sorts ... favorite things, little collections. There are a bunch of kitty figures made out of sculpy, glass and stone. There are these box altar thingys for Ganesha and Kuan Yin figurines that are elsewhere, so a kitty and a different Ganesha sit in them now. 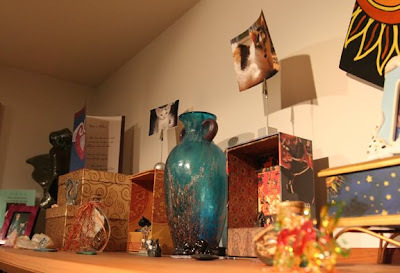 A vase, a sculpture I did, some cool boxes, pictures, crystals and agate slices. I really need to spend some more time in this space to take in all of it's energy and coolness. The problem is my desk and office area is in the basement, where it's cold and dark. Seems that I need to find a way to embrace the cave.